Today I launched my new website for photography education, and announce the availability of four eBooks on the Amazon Kindle platform. 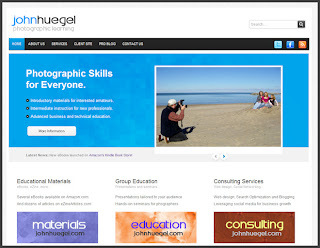 The website is called johnhuegel.com, and will become the central point for my education and training products and services. I purchased the domain last week, and just built the website from a nice clean template. It still needs work, but it’s a good bare-bones website, and it is giving me experience in the HTML world again! I’ll be listing my upcoming seminars and other activities on the website, and will be adding a few more eBooks over the holidays. Please check them out and let me know your thoughts! My existing website at jhphotomusic.com will remain focused on my portrait photography business. In this way, I’m separating the photography activities from the “teaching photography” activities.